Once being the city of Mughals, Delhi houses numerous mosques and dargahs with distinct significances. Amongst those numerous, one popular is Dargah Qutub Sahib. Situated near Gandhak ki Baoli, Dargah Qutub Sahib is an important Muslim pilgrimage site in Delhi and a renowned tourist attraction in the city. This dargah is sacred to Qutub Sahib, popularly known as Qutubuddin Bakhtiyar Kaki - a disciple of Hazrat Moinuddin Chisti of Ajmer. He played a great role in establishing Sufism in and around Delhi. Being the oldest dargah in Delhi, Dargah Qutub Sahib is considered to be highly sacred, and thus, is visited by pilgrims of different regions. As per the beliefs, the wishes of the pilgrims come true if that person truly believes in the saint and ties a thread near the grave of Qutub Sahib. Moreover, once the wish gets fulfilled, the person has to return to unties the thread. Since thread tieing is a ritual in Dargah Qutub Sahib, hence, you can see countless colourful threads tied in the marble screens. 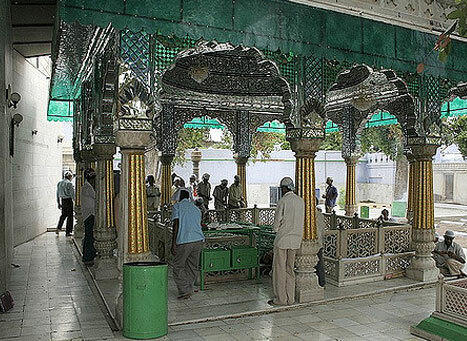 Moreover, the grave of Qutub Sahib is the main shrine of the dargah. It is also said that the graves of various eminent rulers like Akbar II, Shah Alam II, and Bahadur Shah I are also lie buried around the grave of Qutub Sahib. At present, this beautiful mausoleum in Delhi plays an important role in leading the heritage tourism of the city, and therefore, is one of the prime attractions in the region. Dargah Qutub Sahib lies in the middle of an enclosure which is rectangular in shape. It has an Islamic architectural design which is beautifully adorned with a dome-shaped roof. Whereas, the western wall is embellished with colored floral tiles that are said to be added on Aurangzeb’s order. Inside the complex, there is an assembly house (Majlis Khana), mosque, robe chamber (Tosh Khana), few large gates, and drum house tanks (Naubat Khana). On the northern gate of the dargah, one can see the ancient inscriptions. Just a few metres from the Dargah’s Ajmeri Gate, there is Moti Masjid which was built by Bahadur Shah I.
Dargah Qutub Sahib remains open all days throughout the year. Located near Gandhak ki Baoli in Mehrauli village, about 400 meters from Adham Khan's tomb. One can choose to visit Dargah Qutub Sahib any time during the year. However, during winter a whole new charm adds vacation in Delhi soothing and amazing, thus, you can consider this season as the best time to visit Dargah Qutub Sahib and even to explore the city also. Qutub Minar serves as the nearest metro station from Dargah Qutub Sahib which is located at a distance of 1.4 km. The station lies on Yellow Line Metro. There are numerous other places to visit around Dargah Qutub Sahib where you surely want to head out after exploring this place.